Without any kind of support, when sunlight pushes on the sail, it will collapse and flow around the payload. Two ways people have come up with to stabilize the sail and prevent its are to support the sail in 3 dimensions with a structure or to spin the sail. Both methods work well to hold the sail out flat so it can catch as much sunlight as possible. 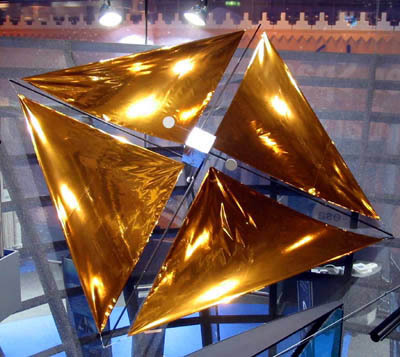 Many solar sail designs use a rigid structure, much like a kite, to hold the sail out to catch sunlight. This is called three axis stabilization, because the structure supports the sail in all three dimensions, or axes, without spinning. The three dimensions come from the two dimensions that lie within the surface of the sail, and the third dimension that is perpendicular to the sail. Attaching the outer edges of the sail to stiff booms that meet at the center of the sail is a good way to prevent collapse in the plane of the sail. The next problem is to prevent these booms from collapsing in the third dimension, like an umbrella being folded. If booms alone are to support a solar sail, they must act as columns and as beams. As columns, the booms prevent the sail from collapsing inward towards the center. As beams, the booms are stiff and fixed at the center, like a diving board, to prevent the sail from folding up like an umbrella. Here are some examples of solar sails that stabilized in this manner. The first picture is by Benjamin Diedrich. The second is by Paul Fjeld (courtesy Christopher Neufeld). The second image is of the original design by the Canadian Solar Sail Project for a proposed race to the moon in 1992 in honor of the 500 year anniversary of Columbus reaching the Americas. This sail has six sections and steers by tilting the segments of the sail like a Venetian blind to change the direction sunlight pushes on the sail. Using a combination of booms, masts, and stays, a 3-axis stabilized solar sail can be made lighter, at the cost of the complexity. By supporting the booms with masts and stays, they only need to act as columns, and not as beams. The masts are set perpendicular to the booms and stays connect between the booms to each other and to the masts. The booms can be made much lighter because the stays and masts prevent the sail from folding up. This kind of structure is similar to a very tall radio antenna that is supported by cables. The following pictures give some example of solar sails with this kind of structure. Pictures contributed by Jerome Wright, courtesy of the Jet Propulsion Laboratory. The first picture is a square solar sail in Earth orbit similar to a sail the Jet Propulsion Laboratory designed in the late 1970's to rendezvous with Halley's Comet during its last approach. Both solar electric (ion engine) and solar sails were studied intensively for the Halley rendezvous, because these low-thrust propulsion methods were the only way to rendezvous with Halley's Comet in the short time available. Unfortunately, funding was cut for both the solar sail and solar electric studies. This sail uses vanes at each corner of the sail which can be rotated to steer the spacecraft by redirecting sunlight. The fourth picture shows a human Mars mission supported by solar sails. Using a sail similar to that designed for the Halley's Comet mission, a single solar sail could carry a large payload from Earth to Mars in 4 to 6 months every two years. Coming back from Mars, the sail passes through the inner asteroid belt before returning to Earth, where it can fly-by a couple asteroids without losing any time returning to Earth. After a lay-over of about 3 months, the sail could leave for Mars and the asteroid belt again. This short short trip time makes solar sails an excellent option for carrying humans to Mars. Spinning a solar sail pulls the sail material out tight and flat so it doesn't collapse when sunlight pushes on it. This is called centripetal acceleration, and is the same effect that prevents water from flowing out of a bucket that is being swung in a circle. Because the sail material itself is very lightweight, it needs to be reinforced with tension lines to carry most of the loads caused by spinning. This results in a sail that needs very little heavy structure, because tension lines are much lighter than the booms used in 3 axis supported solar sails. Thus, spinning sails have potential for being lighter and faster. Circular sails are large, spinning disks supported only by lightweight tension lines to carry loads except at the center, where a structure is needed to carry loads between the payload, control system, and sail. The Jet Propulsion Laboratory studied a solar sail design similar to those shown below in the late 1970's for a rendezvous with Halley's comet. Halley Rendezvous heliogyro designs. By Benjamin Diedrich. Select here for the Povray source. The heliogyro was a design considered by the Jet Propulsion Laboratory for a mission to Halley's Comet. The sail consists of several very long (twelve vanes, seven km in length in the JPL design) vanes extenting from a central hub. The vanes are deployed from rollers by spinning the craft. The centripetal force pulls the sails outwards, unrolling them. The vehicle continues to spin in order to keep the vanes tight. It steers by tilting the vanes, which redirects the solar pressure. NASA's Solar Blade is one of the current projects to fly a nanosatellite heliogyro. Canadian Solar Sail Project final design. By Paul Fjeld. Provided by Christopher Neufeld. This heliogyro is the final design by the Canadian Solar Sail Project. Unlike the JPL designs, this craft steers by shifting a ballast mass so that the center of the craft's mass is misaligned from the center of solar pressure on the sails. This creates torques which turn the craft.